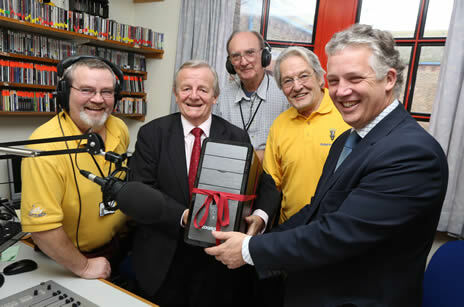 Dorset and Somerset law firm Humphries Kirk has donated a new computer to Ridgeway Radio which broadcasts to Dorset County Hospital patients. Ridgeway Radio, which started in 1966, is run by volunteers and relies on financial support from private and business contributors. The new computer will be used by the station presenters from the hospital. In addition to co-presenting ‘North, South, East and West’, which airs on Tuesday mornings, Barry runs a legal advice slot called ‘Legal Eagles’ every Wednesday from 12pm to 12.30pm, where patients can expect to hear advice on a range of legal topics. Ridgeway Radio requested five new computers to replace ageing studio equipment. Programme presenter and member of the stations’ fundraising team, John Shepherd explained that Dorchester businesses have supported the appeal, he said: “Our task at Ridgeway Radio is to bring the outside world into the hospital and to inform and entertain patients. 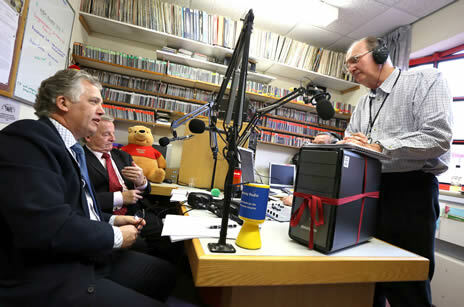 We’re really grateful for the support of benefactors like Humphries Kirk, enabling us to keep on air 24-hours a day. Humphries Kirk provides legal expertise to private and commercial clients, with offices in Dorchester, Crewkerne, Swanage, Wareham, Parkstone, Poole, Bournemouth, and Wareham. The firm also has consulting rooms in Yeovil, Wimborne and London.